THE BIG STORY: Five was Jameson Taillon’s unlucky number Tuesday. He only lasted five innings. He allowed five runs on five hits. But perhaps most surprisingly, he walked a career high five batters. Taillon had never walked more than three batters entering play. After allowing five runs in the first two innings, Taillon was able to settle down and record three scoreless frames to end the night. Getting those extra innings was important since the Pirates’ bullpen has been overtaxed recently. Steven Brault, Edgar Santana and Johnny Barbato were all promoted before the game (Joaquin Benoit and George Kontos were placed on the disabled list while Dovydas Neverauskas was demoted to AAA), but they could have used the extra help Monday. Taillon was warming up to pitch a potential 13th inning last night after all of the available relievers were used. Taillon said tossing Monday did not make an impact Tuesday. Chris Taylor got the Dodgers on the board first when he came home on a Justin Turner grounder in the first. He and pitcher Brock Stewart delivered RBI singles in the second to give LA a quick 4-0 edge. The Pirates roared back in the third, cutting the lead in half with a bloop by Taillon and a blast by Starling Marte. Josh Harrison tied the game later in the inning with a bases loaded double, and John Jaso gave the Bucs a 5-4 with a run scoring groundout. Los Angeles tied the game in the fourth on a two out RBI knock by Taylor. Corey Seager gave the Dodgers the lead for good in the sixth when he plated Adrian Gonzalez on a two out single. Yasmani Grandal added a two run insurance homer in the seventh to cap the scoring. Gonzalez got on base for the eventual game-winning run in the sixth with a leadoff double. It was his 2000th career hit. Taillon threw 11 first pitch strikes to the 24 batters he faced and retired five on three pitches or less. He was relieved by Barbato in the sixth, who took the loss in his first decision of the year. Santana allowed two runs in his two innings of work, striking out two. Daniel Hudson tossed a scoreless ninth. Dodgers’ starter Brock Stewart was pulled after getting rocked in the third, ending his night with five runs on his ledger in 2+ innings. He allowed four hits and four walks while fanning two. Tony Watson improved to 7-4 after tossing a 1-2-3 bottom of the fifth. According to Statcast, Taillon threw 42 four-seamers in his 101 pitches. According to Brooks Baseball and Pitchf/x, that’s the highest percentage of four-seamers he’s thrown all year. The only other time he cracked 40 percent in a start this year was April 11 against the Reds. Trevor Williams (5-6, 4.71) will try to get his revenge against the Dodgers, who roughed him up in his first start of the year in May. Rich Hill (9-4, 3.54) will take the bump for the Dodgers. 1. Gonzalez is the seventh player to record his 2000th hit as a member of the Dodgers. The others are (from most recent): Jeff Kent, Tim Wallach, Brett Butler, Gary Carter, Willie Davis and Maury Wills. 2. 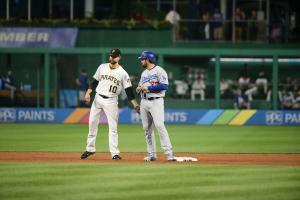 This was the seventh straight game the Pirates scored at least five runs. They are 2-5 in that stretch. 3. 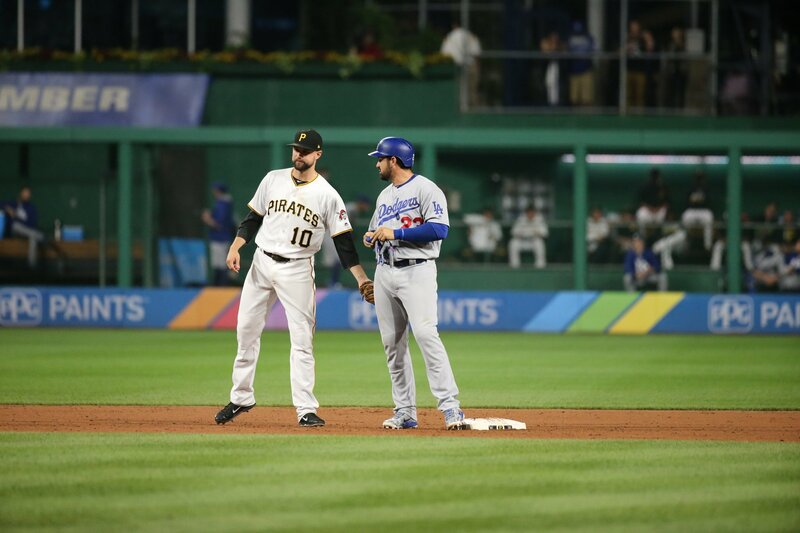 The Pirates are 0-5 against the Dodgers this year. They were a combined 10-3 against them in 2015 and 2016.